Bill Balaskas is an artist, theorist and educator working across different media and dissemination platforms. His works have been widely exhibited internationally, in galleries, museums and film festivals. Recent exhibitions include MACBA, Barcelona; BOZAR, Brussels; EMST National Museum of Contemporary Art, Athens; CA2M, Madrid; Transmediale, Berlin; Le CENTQUATRE, Paris; John Hansard Gallery, Southampton; ARTIUM, Vitoria-Gasteiz; Stavros Niarchos Foundation Cultural Center, Athens; TENT, Rotterdam; Elizabeth Foundation for the Arts, New York; Thessaloniki Biennale; Musée des Abattoirs, Toulouse; London Cultural Olympiad; Maribor, European Capital of Culture; and the British Film Institute, London. Recent lecture-performances and talks include Tate Liverpool; University of Oxford; Sharjah Biennial; Goldsmiths University, London; Germanisches Nationalmuseum, Nuremberg; Central Saint Martins, London; Warburg Haus, Hamburg; De Bijloke Muziekcentrum, Ghent; and the Victoria & Albert Museum, London. Balaskas has received awards from the European Investment Bank Institute; Comité International d’Histoire de l’Art; European Cultural Foundation; Open Society Institute; and the Association of Art Historians, amongst others. In parallel with his artistic practice, he is an editor for the Leonardo Electronic Almanac (The MIT Press), while his writings have also appeared in edited books and in publications such as the Journal of Visual Culture, Third Text and Revista Arta. 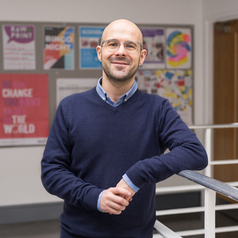 Originally trained as an economist, he holds a PhD in Critical Writing in Art & Design and an MA in Communication Art & Design from the Royal College of Art. Balaskas is an Associate Professor and Research Coordinator at Nottingham Trent University, and an advisor to Arts Council England.